Denny Jump (Bellevue, WA, United States) on 1 December 2017 in Plant & Nature. What an amazing image . . the camera has certainly captured far more that we expect to see. And love your casual reference to the fascinating details ! Wow! You are on fire this week Denny! Great shot! Very, very good! A masterful painting in the firmament ! Five stars to go along with your moon, Denny. It's a very successful picture of the moon. It's a natural for one's imagation to be encouraged. Superb shot. 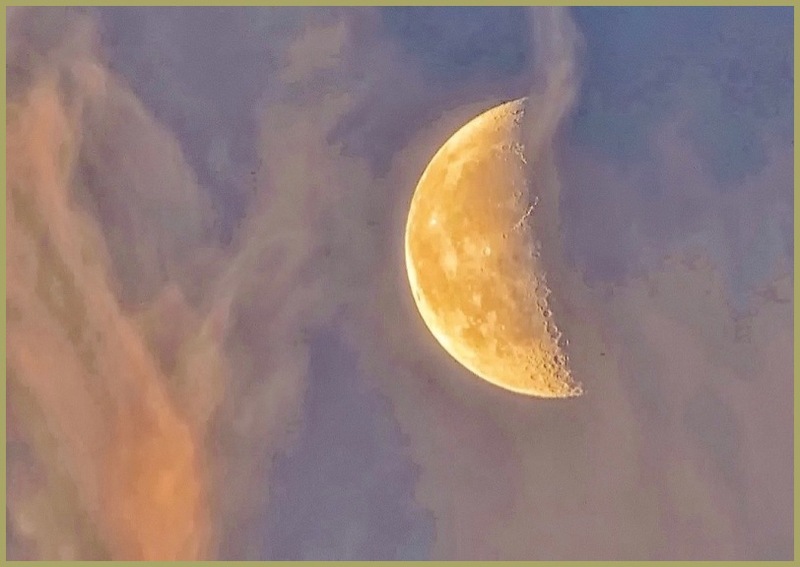 I love the half moon - it looks very mysterious and the swirling clouds add to the atmosphere beautifully. @Hiro: Thank you very much, Hiro! Those moon men stay busy. They should open a restaurant. Spectacular image! @Steve Rice: I hear the Master Chef's name is Flynn;-) Thank you sir! Wow those details !! Bravo.